12 October 2017 – Former Barbados Governor-General Sir Clifford Husbands is dead – Barbados’ longest-serving Governor General Sir Clifford Husbands has passed away at the age of 91. He passed away at his St James residence last night around 11:30 p.m. on 12 October 2017. 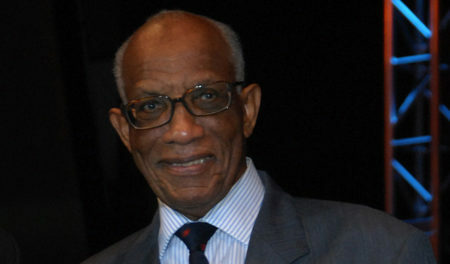 Sir Clifford was appointed as Barbados’ sixth Governor General in 1996 and served until his retirement on 31 October 2011, following the death of Barbados’ first female Governor-General Dame Nita Barrow. Clifford Straughn Husbands, GCMG, KA, was born on the 5 August, 1926 at Morgan Lewis Plantation, in the parish of St. Andrew. He received his primary education at Selah Boy’s Elementary School in St. Lucy between 1931 and 1936, and secondary education at the Parry School and Harrison College between 1936 and 1946. He was Director of Public Prosecutions, a Supreme Court Judge, Justice of Appeal and also acted as Chief Justice before taking up the role of Governor General. He also worked in legal services around the Caribbean, including in Grenada, Antigua and Montserrat and the Attorney General’s Chambers in St. Kitts, Nevis and Anguilla. In recognition of his long and outstanding legal and judicial service to Barbados, Sir Clifford was awarded the Gold Crown of Merit in 1986 and a Companion of Honour in 1989. He received the highest national honour in1995 when he was made a Knight of St. Andrew. He was predeceased in 2009 by his wife Lady Ruby Husbands (née Parris). He was the father of three children – Sandra Dawne Taylor, Anthony, and Laura Husbands.